If you are in the Puget Sound area, you can start your Washington wine tour journey with one of the scenic ferry rides from downtown Seattle to Bainbridge Island or from Edmonds, north of Seattle, to Kingston. Follow the signs to cross the spectacular Hood Canal Floating Bridge on Washington Hwy 104 and the gateway to the beautiful Olympic Peninsula. Starting on Washington Hwy 101 South of Port Angeles you’ll find Harbinger Winery located in a sheet metal chic facility right on Washington Highway 101. Next stop is the beautiful grounds of Camaraderie Cellars, just one mile east on Benson Road. Continue back east on Washington Hwy 101 through Port Angeles to the old historic barn of Olympic Cellars on the highway about half-way between Sequim and Port Angeles. 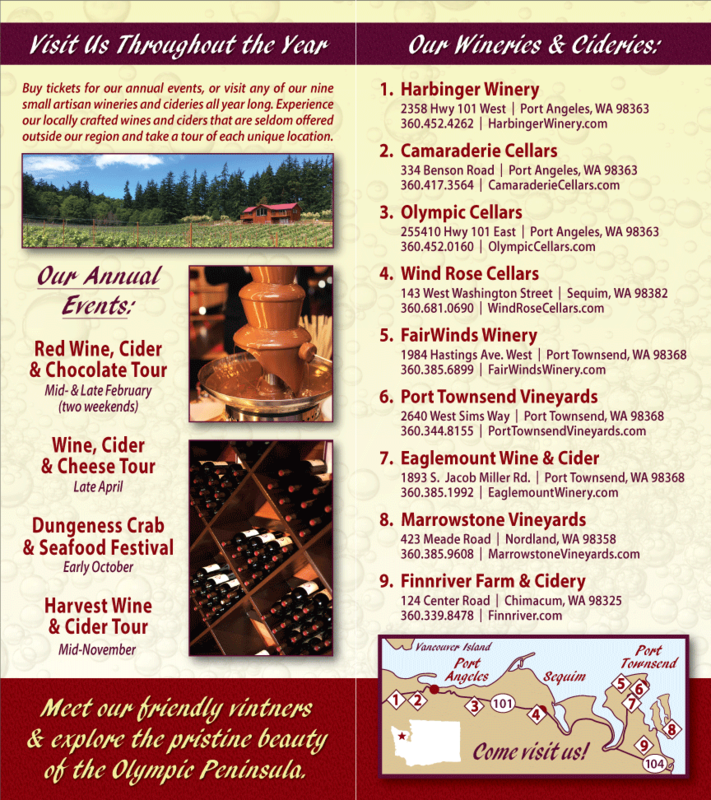 Follow Washington Hwy 101 east to Sequim and visit Wind Rose Cellars, located in downtown Sequim. Continue on HWY 101 east to Discovery Bay and the turnoff to Hwy 20 north, about 11 miles in – HWY 101 will turn into Sims Way where you’ll find our newest member, Port Townsend Winery located at the southern entry into Port Townsend and includes a unique tasting room experience. Continue east on Sims way, left on Howard st (turns into Discovery Rd. ), left on Sheridan and left on Hastings which will bring you to FairWinds Winery’s in a beautiful country setting just a little further north. From FairWinds, you’ll head west on Hastings and turn left on S. Jacob Miller Rd to find Eaglemount Winery & Cidery only 3 miles away. On your return to Hwy 101, travel south on Route 19 towards Chimacum. Follow the signs to Rt. 116, following signs towards Fort Flagler and Nordland to get onto Marrowstone Island. Marrowstone Vineyards is on Meade Road, which is a right turn off of Flagler Road (Rt. 116). Return from Marrowstone Island to Hwy 20. The next stop on your Olympic Peninsula Winery journey is Finnriver Cider and sustainable farm, located off Center Road. The Olympic Peninsula Wineries of this Washington wine tour may also be accessed from Hwy 101 northbound from the Olympia area or the ocean beaches on the west. Extend your trip by adding stops to enjoy many of the scenic wonders and the huge variety of activities available to you. Popular sites and activities Olympic Peninsula of Washington include Olympic National Park with its alpine meadows, rain forest and ocean beaches, a variety of state parks, uncrowded beaches, whale watching excursions, kayaking, biking and hiking trails, golf and shopping. See our Travel Guide for helpful links to exploring our area.